Your kid starts a YouTube channel, or a blog, or some other creative outlet online. Should you support it or kill it? Will it take time and attention away from school work, and just increase their likely over-spent “screen time”? 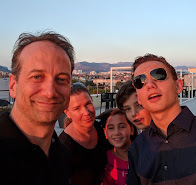 My 13- year-old son’s experience with his YouTube channel - Techspective - has been an eye opener for me and I thought it would be worth sharing why I have become a strong supporter* (and subscriber) and share the long list of skills I see him learning in this endeavor. Within the past year, my son, Jeremy, started showing a deep interest in making videos. He was mostly inspired by the other young talents he saw on YouTube (one in particular) and by a friend of his, who had started a business making videos for local sports and events. Jeremy saved every penny he earned from babysitting, dog-walking and landscaping odd-jobs and bought his first DSLR camera. As his geek dad, I was interested in supporting his technical interests and approved of an experimental YouTube channel that he started with his friend. Their early videos were simple - and while not exactly professional, they showed a clear production quality and potential that was, frankly, surprising. They were constantly learning new technology and quickly expanded from simple videos to live video streams - where other people (mostly their friends) could join in real-time to discuss technology and ask live questions of the two self-proclaimed "mobile gadget reviewers". They were energized and it was fun to watch. After a few months, the two young video producers decided to go their own way "professionally" (his friend still produces on the Mobile Gadget channel, while Jeremy produces on Techspective). In the past few months I've watched the quality of their video production go from "not bad" to "wow!". Checking myself every once in a while to be sure I wasn’t overly biased, I’ve shared links with friends and others, only to confirm my view - their videos have become high quality, useful and fun to watch. My main concern in all this was the time being spent on his hobby versus time on his school work, sports, outdoor activities and actual (non-virtual) social activities. Was he too focused on improving the quality and subscriber numbers of his YouTube videos at the expense of his school grades? While I knew he was getting a tremendous amount of personal satisfaction, was it worth risking lower grades at school? It was that internal dilemma that motivated me to consider more concretely all the skills my son was developing in pursuit of his creative and technical passion. He was meticulously writing the words to his next video - painstakingly considering every sentence in his story until it sounded just right. In his mind he was simultaneously planning out his “B roll” video footage. He was composing a story, using advanced vocabulary and other language skills, orchestrating his story to a video backdrop, which he then filmed and edited. The quality of that finished video jumped several levels from his previous work. It struck me at that moment that this was a much more complex and multi-faceted assignment than much of what he had done in school. This is a high-level way to describe how many of the underlying skills come together into something I would describe as “leadership”. Without explicitly thinking of it, he is identifying his market (who he was trying to reach), the product he aimed to provide, the identity and quality of his product, the methods of production and delivery - everything to go from idea to launch. It’s the “figure it out as I go” method of training mostly - but in the end, he got a feeling for what my job is as a PM - to define, launch and manage a product. In this he also starts learning a critical professional and life skill - the trade offs that must be made between time, quality and cost to get something done. Well-produced videos require a strong story, and once he started using scripts, the stories he was telling became more complete and interesting. He was even using skills he learned in early story-writing from school, whether he knew it or not. Every video produced has many hours of research behind it. While he might rattle off product specs or references to tech industry events in the matter of seconds in the finished video, there were likely hours of research into product details, industry news sites, blogs and more. It’s not easy work, as he has learned, to create a visual story which has not just his insights, but facts. This is likely the most compelling part that many kids, and adults, can use - practicing speaking out loud, even to a virtual crowd on the other end of a video camera lens. I’ve overheard Jeremy speaking his scripts out loud and then recording many takes of his “performance” in front of the camera. I cannot emphasize enough how valuable this is - for a teenager to not only practice speaking “his/her lines” but also to see him/herself on video. It builds self-esteem and helps kids gain an appreciation for how they are perceived by others. He also learned that writing a script - even if not followed precisely - reduces the “ummmm”s in vocal storytelling. Put several of these skills together, and you get better communication skills. This is something that many kids opportunistically avoid until there are specifically forced to in school or other activities. The more they avoid it, the harder it is to do when they need to - so they avoid it again - and the “lack of communication” downward spiral continues. By pursuing a creative channel they enjoy, they are developing and practicing a much more sophisticated communication style. Video-making, blogging, even emailing, can be fantastic exercises for improving communication skills. This is an area in which I saw clear improvement over time. For video in particular, I think it’s easy to watch yourself on screen and understand how your message can be improved. That improvement is often in message clarity and cutting out the unnecessary (not just “the umms”, but even unnecessary or redundant information and commentary). Taking video can be easy, but as you set your sights to higher quality, you start thinking “what will make this shot more interesting” and you become a director and producer. I’m a firm believer that even a phone cam can be adequate for great videos, especially for beginners. Learning all the other skills will take plenty of time anyway before worrying about high-end camera equipment. It doesn’t take long for a video hobbyist to discover that post-production editing is the bulk of the work. The combination of creative skills and technical software skills can turn a bunch of junky clips into a great video. Jeremy learned a few video editing apps, finally landing on Adobe Premiere (that choice itself also required research and decision making) and he honed his creative skills in a big way. An otherwise good video can be ruined quickly with bad sound. There’s a whole set of occupations in just this one aspect of production, and a YouTuber has to learn at least the basics. The YouTube channel, the logo, the supporting website, the twitter page, the G+ page, etc… it all requires some design work. Through experimentation and practice comes not only skills, but the confidence to try next time. Getting views on your video and subscribers to your channel is not all abra-ca-beiber magic. It takes work. A successful indie YouTuber needs to support the channel with supporting social interactions which are thoughtful, well-timed and relevant. This is a marketable skill too - many businesses would pay you well to do this effectively for them. It’s rare for any effort to be fully “solo” - and I watched Jeremy collaborate with friends, teachers, business owners and others in ways that he never would have been exposed to without the goals of his YouTube channel to motivate him. Ultimately, a YouTube video artist is competing for attention. Ethical competition is something you learn in games and sports - but you can also learn it in the digital world. Some YouTube commenters have nothing constructive to say, and I can’t say anything good about them except that they help others learn the art of “reactive restraint”. Kids learn quickly how to engage, but mostly, not to engage. They learn this better than adults in my experience - and better to learn this skill early. These kids will send less of those escalating, reactive responses we see too often even in the most professional environments. Put all the product design, creation, execution, marketing and communication bits together, and you have an entrepreneur. While it might not be a money-making operation, it is an operation. In Jeremy’s case, he has used his skills already for some paid video work for business owners in the local area. So far, I'm a huge supporter* of Jeremy's video-making hobby - and proud to be one of Techspective’s (and Mobile Gadget’s) first subscribers. Sure, I truly enjoy watching his videos, but more than that, I love watching his skills grow through self-directed learning and experimentation - not because someone told him to learn something, but because he’s motivated to achieve a goal that requires learning. He is pursuing a goal he is passionate about, which happens to be creative, complex, interesting and relevant. I could never suppress his natural desire to learn - that would be inexcusable - even if it does mean he might get a lower grade on his next history test.